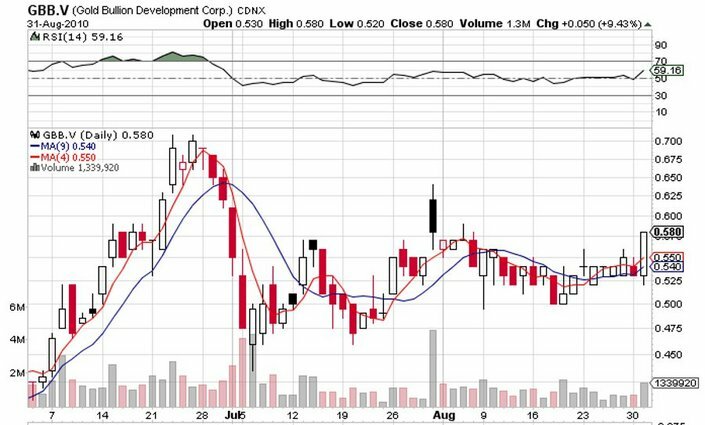 Yesterday, Gold Bullion Development Corporation (CVE:GBB), (PINK:GBBFF) stock added more gold to its value on the company's news about expanding the Long Bars Zone Eastern Extension. GBB stock closed the market at $0.580 on a heavy volume. During the session, more than 1.3 million shares changed hands. The share price jump of 9.43% confirmed even more the investors' appreciation of the latest company's update, published on GBB web site parallel to the above mentioned release. The second half of August was very positive for GBB stock. Being in an almost constantly upward direction, GBB is probably these days aimed to restore its good performance and reach the levels of this June. Further more, GBBFF closed the session at $0.494 with a 0.2% pull back from the previous day. The volume traded was also weak. Today's trading session will show whether investors of GBBFF are already accustomed to the releases about the next step of the drilling program implementation, or they will still get inspired by the company's news. Since Gold Bullion Development Corporation expects to release additional assay results next week, it can be expected that the interest towards the company's shares will be still hot. A member of the Stocktipr.com community called that pick in march and received a confident score of 81%. Is new pick is also concerning this company and he believe that the price could reach 0.75$. He is the number one tipper in this great community! 11,5% up also Thursday. Can be really something when results from 80 holes starts coming in next week.